The perfect tool for any business carrying clamshell packaged products! The Ultrasonic Clamshell Sealer is a must-have: It’s a multi heat multipurpose hand held tool designed to seal clamshell packaging. It’s also great at tacking. And it’s not just built to handle clamshells: It can spot seal OPS, PSP, PVC, and EPS packaging too! The Ultrasonic Clamshell Sealer comes with a 90 Day Warranty on Parts and Labor. If you're looking for a tool that's easy to use and portable, look no further than this sealer for your package maintenance needs. No retail store or purveyor of fine electronics should be without it! If you’re part of a business that deals with products in clamshell packaging, the Ultrasonic Clamshell Sealer is a must. This handy precision tool makes securing your clamshells easy. 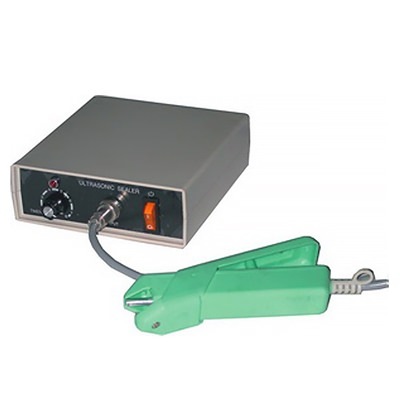 The Ultrasonic Clamshell Sealer is a multi heat multipurpose hand held tool. It’s designed to seal clamshell packaging. It’s also great for tacking. It can also spot seal OPS, PSP, PVC, and EPS packaging as well. It's hard to think of another tool that can rival it in terms of its portability, ease of access, and versatility. Think of the money you can save by owning your own clamshell sealer. All those customer returns that you can reseal yourself and put back on the shelf, rather than wait for a package to come in and replace it. A clamshell package gets jostled on the sales floor and comes loose? No problem: The Ultrasonic Clamshell Sealer will have that clamshell sealed tight as an actual clam in no time! This powerful tool comes with a 90 Day Warranty on Parts and Labor.